Home » BJJ Belts & Promotion » Should a lower belt student ever be able to tap out a higher belt in BJJ? Should a lower belt student ever be able to tap out a higher belt in BJJ? Brazilian Jiu-Jitsu ranks are at the same time incredibly meaningful and entirely meaningless. Belts and stripes are a powerful tool for measuring progress and for creating a sense of community within a gym. When an instructor awards a belt, students naturally find that experience very meaningful. The belt represents at once the student’s growth and the instructor’s recognition of that growth. At the same time, advancing in rank can also signify a larger role within the gym as upper belts are often informally expected to be mentors. These sorts of things give a belt meaning. From gym to gym though, ranks are a lot fuzzier. The skill level of a purple belt in one gym can be dramatically different from the skill level of a purple belt from another gym. Perhaps one gym holds students back longer for competition purposes. Perhaps one student trains full-time and the other trains a few times a week because of work and family obligations. Maybe one is younger and athletic and the other is older but has been training longer. Can you start to see how even at the same rank two jiu-jiteiros of the same rank could not be precisely equal in competitive terms? 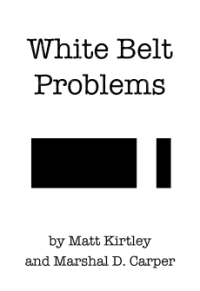 In this way, an athletic blue belt that trains six days a week and competes regularly could be a handful for a brown belt that only trains three times a week as a hobby. If a lower belt taps an upper belt, it’s not the end of the world. It happens, for many different reasons. Again, focus on training and learning, not on who wins and who loses.